Give a unique valentine this year! 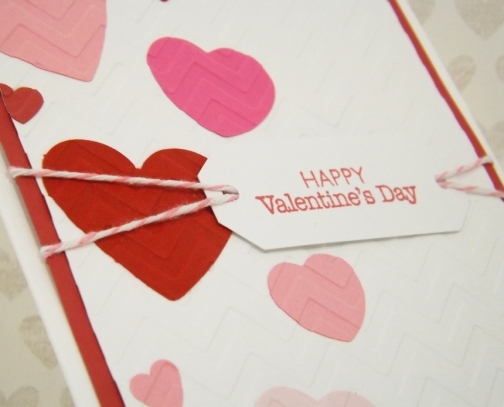 This handmade valentine card (with envelope) features an raised design. A flutter of pink and red hearts have been layered on the front and then embossed into the card. Twine holds the Valentine's Day greeting on the front. 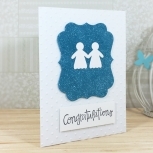 Simple yet elegant, this card is unisex - perfect for him or for her! The inside of this card is blank. This hand made greeting card measures 4.25 by 5.5 inches (roughly 10.75 by 14 cm) and comes with a plain, white envelope. It comes in a resealable, cellophane sleeve. You can place your completed card and envelope (with appropriate postage) back into the cello sleeve to mail it to help protect from rainy weather!